In modern pop sci, no series has been able to capture the essence of time travel in the way Doctor Who has for the last 50 years. It should come as no surprise that scientists have taken the time to look into the feasibility of the physics driving time travel in whoovian mythology (*Spoiler alert* the TARDIS isn’t nearly as unscientific as it might sound). The team was led by Martin Ringbauer, an author and a scholar from UQ’s School of Mathematics and Physics. They essentially combined tenets of two of the most immeasurably important theories that were ever put forth to describe the universe: General relativity and quantum mechanics. These theories that are seemingly contradictory (which caused Einstein to be fiercely skeptical of quantum mechanics, leading other scientists to eventually call this skepticism “Einstein’s biggest blunder”). General relativity describes the universe on a macroscale (from stars and galaxies, to black holes), while quantum mechanics describes the universe at a microscale (from photons and quarks, to molecules). Einstein’s theories of general and special relativity discuss time and how it doesn’t tick at the same rate across the entirety of the universe. This opens the floodgates for a number of different methods of time travel. The most well-known method purports that time travel could be achieved if we were able to travel faster than the speed of light (a steady rate of 186282 miles/299792 kilometers per second). As the theory goes, the faster you move through the 3 dimensions of space, the slower you move through time (the 4th dimension). Once the speed is on par with that of a photon, the flow of time essentially stops for the subject; however, it moves as it normally would for an observer. However, this theory doesn’t work for the macroworld, as photons — key building blocks of light — can only travel as fast as they do because they are mass-less. Propelling anything with mass to such speeds would require an extraordinary amount of energy, perhaps an endless amount (an infinite amount), because the object’s mass would become infinite in the process. This effectively destroys the notion that humans could trave through time by travelling faster than the speed of light. If that’s not enough of a problem, another issue surfaces when we follow the traditional route of time travel, something that is generally called the “Grandfather paradox.” Thought up by Kurt Gödel in the mid 20th century, the paradox basically says that, if a person were to travel back in time to slaughter his or her grandfather, a domino effect would start, which would eventually lead to the time traveler never having been born at all. Since the person was never born, they could never have hopped in their Delorian and gone back through time to kill their grandfather to start with. Kind of paradoxical, no? Of course there are a few other ways to time travel, which is what the University of Queensland physicists explored. 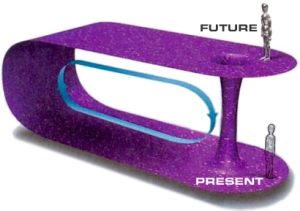 In order to simulate time travel, the team used a series of photons and cleverly manipulated them by shifting them along a path that eventually leads back to the same point in space, but at a different time (meaning, an object that travels along one of these paths finds itself back in the same spot but in the past, despite some time having passed during the journey; this is often referred to as a closed time-like curve). These constructs were originally put forth about 75 years ago by Willem Jacob van Stockum, a mathematician who remains an unsung hero for his role in the development of general relativity. These constructs are, simply put, a mathematical solution to time travel. Yet, the existence of the curves pose their own set of conundrums (namely, where casualty is concerned). There is also still an issue with paradoxes (like the infinite loop of cause and effect brought on by the Grandfather paradox). Since they were originally proposed, scientists were convinced that it was likely impossible to avoid such paradoxes from manifesting. That is, until it was first suggested that we might bypass them by dealing with microscopic building blocks of matter. We’ve long known that the wacky subatomic world doesn’t abide by normal rules, so it’s fitting that time doesn’t work in the same way on the microscopic level; thus, the quantum world might not have so many paradoxes when it comes to time travel. “Quantum systems can exist in a mixture of existing and non-existing states. In the classical state, you can either exist or not, but quantum systems can operte in both which resolves the paradoxes and time-travel can be formulated in a self-consistent way,” Ringbauer said. However, he added that here is no proof that the laws of physics bend to this sort of phenomena on a normal basis, but it could thrive in extremely alien environments — perhaps near a black hole or a neutron star — in places that seem to violate the very fundamental laws governing the universe, or at the very least, the tenets of general relativity. Applying this information, the team charted the journey of two photons traveling along one of these closed time-like curves. One was sent through a wormhole, while the other probed spacetime and closed time-like curves themselves. They found that the first photon interacted with the other particle and eventually positioned itself into the original photon’s spot. On a final note, when speaking to Fairfax Media, Ringbauer was clear about the true nature of his findings, saying that: “This research is certainly not a demonstration of time travel or proof it’s possible. We were starting from the point to discover what would happen if it was possible.” At the very least, their work might once again revolutionize quantum communication research. It might even poke holes in the foundation of Heisenberg’s uncertainty principle. We shall see. The paper, entitled “Experimental Simulation of Closed Timelike Curves,” was recently published in Nature Communications.